With La Réserve having built its name on unapologetic luxury, it’s no surprise that its Genèva hotel ticks all the boxes when it comes to providing an opulence of services that on arrival seem superfluous, but on departure have become all but necessary. The latest addition to the La Réserve Hotel and Spa Geneva, Villa du Lac, is a grand continuation of this new standard of luxury. 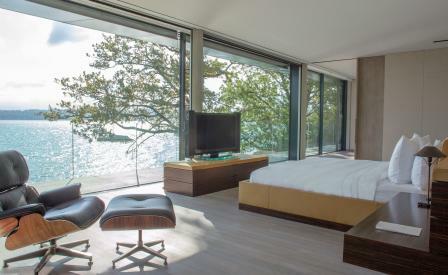 Sitting on the shores of Lake Geneva, the private villa is a unique space that possesses all the amenities of a hotel with the privacy of an independent property. And while the term ‘villa’ doesn’t do it justice — du Lac includes a private garden, two lounges, a study area and a dining room, as well as a personal concierge and private boat transfers to and from Geneva city — the property does have the intimacy of a private home. Spread over two levels and sheathed in glass, du Lac was designed by Rémi Tessier, who, by way of floor-to-ceiling windows, has invited the beauty of Lake Geneva, the Alps and Mont Blanc into every room, while balconies in bedrooms provide a further gateway to the surrounding scenery. A neutral palette, formed in part by cream leather upholstery, long, narrow concrete pillars and unfinished stone brickwork, links the project aesthetically to La Reserve’s other properties, though bursts of colour sporadically interject thanks to a carefully curated selection of art. Should the solitude prove too overwhelming, du Lac is just few steps from the hotel’s five restaurants, and its Nescens spa, complete with indoor swimming pool, sauna, hammam, tennis courts.